Available on sale at Amazon now! Click here to see a really innovative and creative trailer of the Babysitting SugarPaw! You won't regret it! I was given the opportunity to review this delightful children's book titled Babysitting SugarPaw by VS Grenier and illustrated by Kevin Collier because of my membership at the Product Review Place. 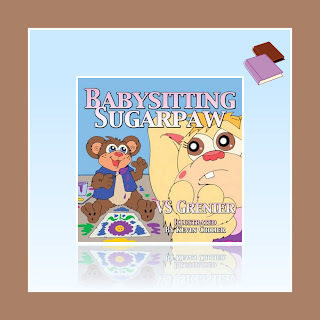 The book, targeting children ages 3 to 8, tells the story of SugarPaw and his babysitter. As many children can relate to having babysitters in this day and age, the story confronts the issue of being left with a babysitter for the first time and choices of right and wrong. It provides the children an opportunity to see how one should behave while teaching that not everything is how it seems and you should give it a chance. I thought the story's lesson was good and the illustrations were excellent. I was surprised at how patient Bonnie Whiskers was throughout all the episodes that SugarPaw put her through. VS Grenier is an award winning author and Editor-in-Chief of Stories for Children Magazine. VS Grenier's experience at the Institute Children's Literature taught her how to hone her writing skills. To learn more about VS Grenier, visit http://www.vsgrenier.com/. The fun doesn't stop there as there is an online monthly magazine called Stories for Children. This online magazine targets children ages 3 to 12 and contains fun stories, articles, puzzles, games, book reviews, crafts and poems. Visit http://www.storiesforchildrenmagazine.org/ for more information. VS Grenier also sponsors a program that helps predominantly low income children receive books from First Book. VS Grenier has joined First Book who works with many authors and publishers to achieve this great goal. Visit vsgrenier.com/BabysittingSugarPaw.aspx and purchase an autographed copy of Babysitting SugarPaw and 25% of the sales will go to First Book. Buy and donate a copy of Babysitting SugarPaw to First Book. Leave a comment that you would like to win this and follow my blog. Comment on another blog entry story and come back here and leave a comment. Maximum of five comments per day. Giveaway ends October 20, 2009 at 10:00 pm EST. I would like to win this for my niece and I subscribe. I would love to win for my daughter. Thanks! I would like to win this for my young neice. I follow your blog. I would love to win this for my little one...we love to read books and this would be a great one to add to our collection!